The Domestic Pressure Booster System is a life-style product best suited for water supply for shower panels, garden, sprinklers and multi storied bungalows. It is perfect for use in homes, clubs, hotels, hospitals etc. Very aptly named ‘ShowerJoy pressure booster system’ this product gives the user the pleasure of sharp, tingling jets of water while using the shower panel. Makes gardening very convenient as it is able to supply high pressure needed for sprinkler system. Also very useful for water supply connection to multiply bathrooms such as in hotels, bungalows where water supply is needed at a constant pressure. 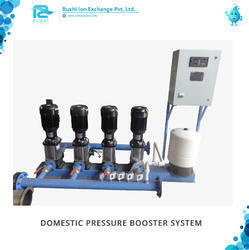 Looking for “Pressure Booster System”?